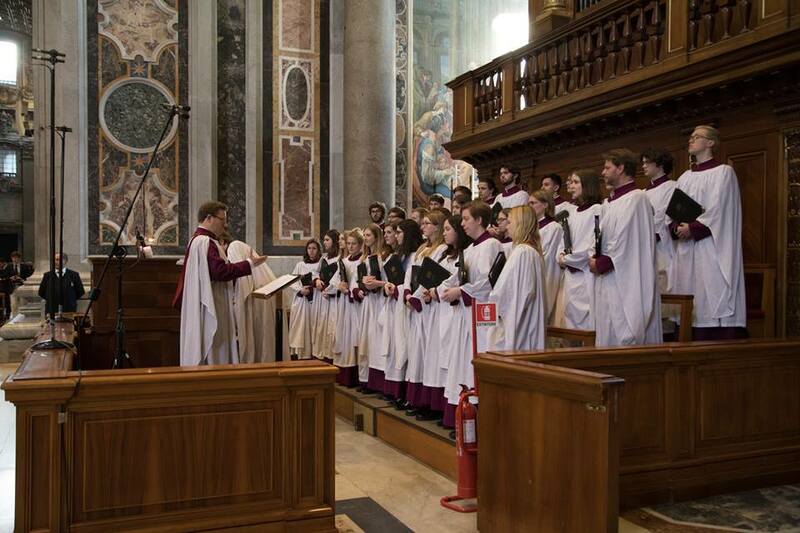 The choir of Merton College, Oxford sang a traditional Anglican Choral Evensong in St Peter’s Basilica. An ecumenical milestone was marked in the Vatican on Monday as a traditional Anglican Choral Evensong was celebrated for the first time in St Peter’s Basilica. Cardinal Angelo Comastri, Archpriest of the Basilica, gave permission for the historic event during meetings with Archbishop David Moxon, Director of the Anglican Centre in Rome. The renowned choir of Merton College, Oxford came to sing music written at the time of the Reformation, as well as contemporary compositions and well-loved Anglican hymns. This celebration marks another important step in the deepening of relationships between Anglicans and Catholics. It comes just two weeks after Pope Francis’ visit to the Anglican parish church of All Saints and just five months after the Pope and the Archbishop of Canterbury celebrated Vespers together at the Rome Basilica of St Gregory on the Caelian Hill. Anglican and Catholic bishops and clergy gathered together at the altar below Bernini’s great bronze sculpture holding the Chair of St Peter. Archbishop David Moxon presided at the liturgy, celebrated with ancient words and music recalling the days of the English Renaissance. Music by the great English composer William Byrd filled the basilica, as well as some more contemporary works, while the words of the liturgy and readings were those of the 1662 Book of Common Prayer. Significantly the celebration took place the day after the Church traditionally marked the feast of St Gregory the Great. It was he who sent Augustine, prior of a Benedictine monastery in Rome, to evangelise the English in the year 597. And it was he whom English Catholic Archbishop Arthur Roche, Secretary of the Vatican’s congregation for Divine Worship and the Sacraments, recalled in his sermon, highlighting Pope Gregory’s humility, courage and missionary spirit.